Why does the Vendée Globe remain, in the eyes of many, the gold standard of global ocean races? Simply put, because of the purity of its challenge: one skipper, one boat, one world, nonstop, set out from Les Sables d’Olonne, France, and then sail around the planet leaving Antarctica to starboard. The first one back to France wins. The race continues to attract the world’s most experienced sailors. This year there will be two skippers sailing their ninth global race, and a past winner and two past runners-up among the 14 returning veterans. Five rookies will also be on the starting line November 10. Among these will be Italian Alessandro Di Benedetto, who recently sailed a 21-foot Mini along the same route as the Vendée, broke his mast at Cape Horn, jury-rigged its two pieces back together, and continued on to finish the route nonstop in 268 days. We applaud 90-foot Rambler’s breaking of the Bermuda record with 20 crew aboard averaging 16 knots for 650 miles in under 2 days. But how about Vendée Globe 2008-9 winner Michel Desjoyeaux? He not only recorded a speed of 30.44 knots under autopilot, but set his 5,000-square-foot spinnaker alone in 27 knots of wind, and averaged 14 knots for 28,300 nautical miles over 84 days. Competing in the Vendée means being on high alert round-the-clock. The Open 60s in the race are huge, the rigs are gigantic, it’s stifling hot in the tropics, and it’s freezing cold in the Southern Ocean gales. Will you be able to make the inevitable repairs? Will you have to go aloft? Will you be injured thousands of miles from help? And perhaps, most important, will you live up to standards of the competitiors who went before you, the storied legacy that is the Vendée Globe? For the 2008-09 edition of the race, 300,000 people came to the start, and three-quarters of a million people over three weeks walked the docks to see the boats and talk with the skippers and shore crews. Why? Because at its heart, the Vendée Globe is both an incredible dream and a daring adventure, one that transcends national boundaries and appeals to people from all walks of life. I’ll be glued to it. A view of Pegaso's laboratory area on the main deck -- fitted with a range of technology that allows the on board team of scientists to do everything from tracking endangered marine life to studying water pollution levels. 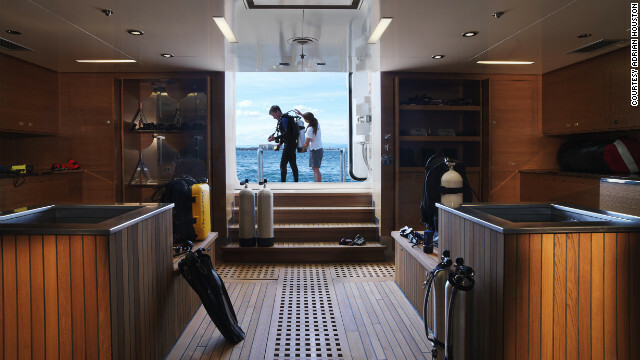 Pegaso was born as an idea on a chart table aboard the owner's first yacht whilst cruising in Fiji. The RV Pegaso is a 73.6 meter superyacht boasting a fully-equipped, cutting edge marine laboratory big enough to house a team of 12 scientists. 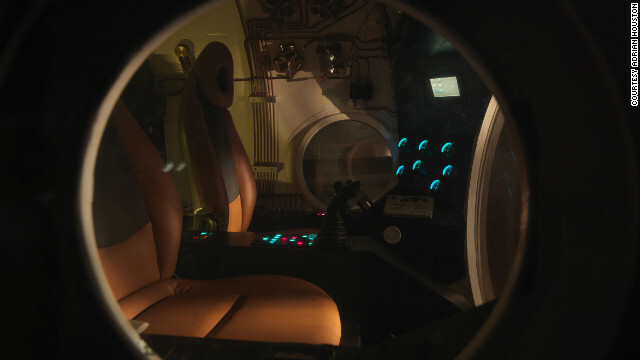 The research vessel is equipped with a five-person submarine. 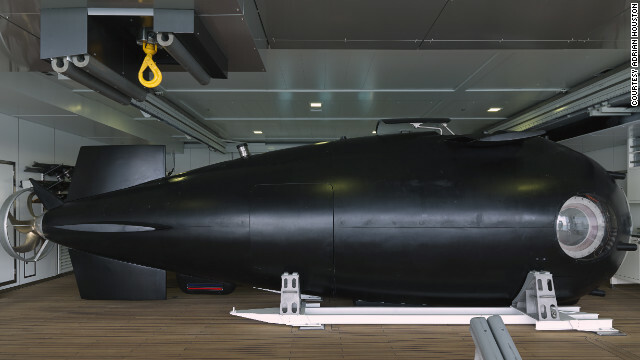 Weighing 14 tons, it is the world's only privately owned diver-lockout sub, according to its management company, allowing divers to enter and leave underwater via different chambers. 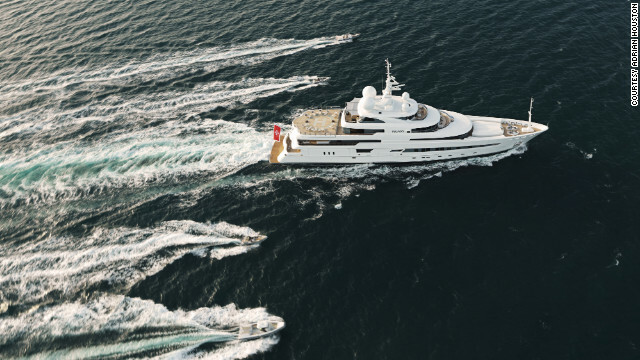 Alex Flemming is the chief executive of the yacht's managing company, Pegaso Marine. 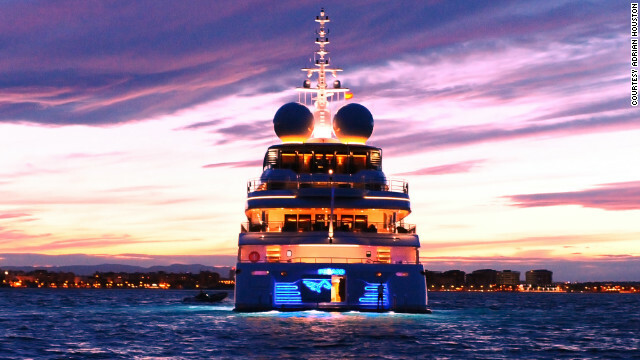 He explains that anyone who charters the yacht can have as much or as little involvement in the research as they like, with the one condition that they always allow a group of scientists to travel with them. "The historic perception of the superyacht set is the south of France, drinking champagne and having a lovely time," he said. " 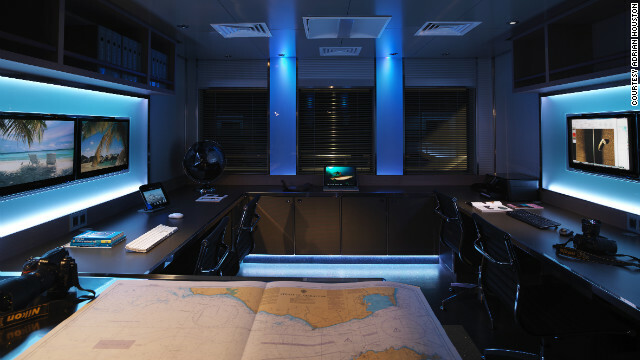 Along with cutting edge scientific facilities are all the luxury comforts you'd expect from a superyacht. 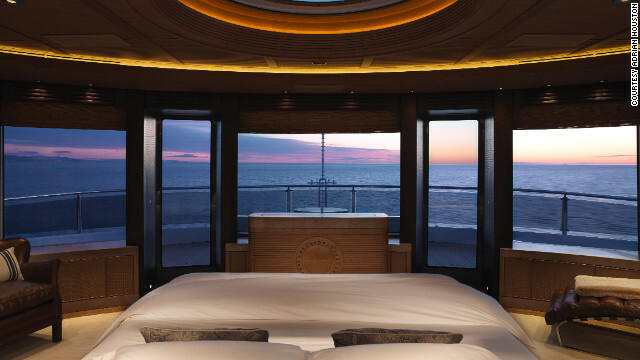 Boasting six double bedrooms, the number of scientists is dependent on the number of guests on board. The sub has standing room of 1.8meters and can travel to 170 meters under water, allowing guests to explore at depths few have ventured before. Such experiences can be transforming. Dooley recounts the journey of a guest aboard a similar research vessel in the Socorro Islands, just off Mexico, who helped scientists tag giant manta rays in an effort to track their migration patterns. Above is a good primer on ocean acidification narrated by Dan Laffoley of the International Union for Conservation of Nature (IUCN). The video spans the vulnerable corals of Australia's Great Barrier Reef to the equally vulnerable shellfish industry of the Pacific Northwest, detailing the potential effects of a more acidic ocean. To those unfamiliar with global warming's "evil twin", the video does a good job of explaining the basics of ocean acidification: simply put, carbon dioxide reacts with ocean water to make carbonic acid. The ocean absorbs about a quarter of civilization's carbon dioxide emissions, and as a result they are now 30 percent more acidic than before the industrial revolution. What does this mean for animals like clams, corals, or oysters that rely on a more stable pH range to build their calcium carbonate skeletons and shells? Mother nature has provided some of her own experiments, as documented in the video. Near Vesuvius in the Mediterranean carbon dioxide bubbles up from below, rendering a glimpse in to a future, more acidic, and bleaker ocean. Closer to the vents, where the water is more saturated with carbon dioxide, the communities of life become less diverse and invasive algaes thrive. Off of Australia, the Great Barrier Reef is already struggling in the new man-made environment. As more and more acidic water continues to erode the corals in the coming decades, these ecosystems of otherworldly beauty and diversity could simply go extinct. Perhaps most worrisome of all is the effect of acidification on pteropods, a shell forming plankton at the very bottom of the ocean's food web, nicknamed the "potato chips of the sea". These animals are especially vulnerable to acidification, and as the narrator ominously intones: "If their shells dissolve a critical part of the food web dissolves with them". Learn more about ocean acidification and what you can do to help. We the People are fascinated with speed, pushing ourselves ever faster, be it on water, on land in the air or in space. For Millennia the quest for speed was among the main driving forces of progress. Boatbuilding, railroads, automotive and aerospace industries - all grew and advanced fueled by our insatiable appetite for moving faster, for covering greater distances in less time. Ocean liners that plied the waters between Europe and America were fighting for the famous Blue Riband Trophy. Just an honorary prize with no monetary value, it generated fierce competition with great rewards for the Trophy holders. Quest for the Blue Riband contributed greatly to the technological advancement and led to explosion of commerce between America and Europe. Over the last two decades the quest for speed in sailing has for the most part been led by a small elite group of high performance multihull enthusiasts represented mostly by the sailors from a single nation - France. The common perception is that monohulls are inheritantly slow and nothing could ever change this. A quick animation of the SpeedDream 35 prototype. We are confident that our innovative design concept will result in a super-fast monohull capable of beating catamarans and trimarans in their own game and establish a string of speed records, from sailing faster than 50 knots in the open ocean to circling the globe in less time than any yacht ever. We believe that the true impact of this daring project will extend far beyond setting new sailing records, no matter how lofty they are. Through the SpeedDream innovative media communication devices, we will take sailors and non-sailors alike on a thrilling ride that reaches beyond the limits of our current knowledge. We will inspire imagination and challenge established perceptions. The tourist's view from a government-run restaurant near Playa Larga, Cuba. Sharks… deep-water rigs… coastal development… fish for tourists… empty markets. Paolo Pellegrin’s images reveal poignant photos of weary faces and urban crowds, but the ocean is generally an unseen character in the drama. Still, when reading the article, you don’t need to be a marine biologist to sense that the ocean is inseparable from the modern Cuban narrative. Cuban fisherman prepares a giant spotted eagle ray on the shores near the site of the 1961 Bay of Pigs invasion. In this blog series, I’ve selected images that add some illustration to ocean issues mentioned in the article. Some photos are my own, others captured by colleagues. All deal with the critical role of the ocean that surrounds an island teetering between isolation and globalization. Now, my grasp of the Cuban experience is not first-hand. I share these photos as a witness to ocean change across the Caribbean. By good fortune, I’ve been a recent explorer of Cuba’s coastline. Before visiting Cuba for research, I had romanticized about a people and an environment trapped in time. My intent is that these photos and insights convey the opposite: this patch of ocean is dynamic, so are its users. Cuba’s waters pulse with bounty, danger, and hope while its people continually give and take from these waters to adapt for tomorrow. Food security is a focal point of author Cynthia Gorney’s feature article – and of many conversations I’ve heard around Havana. In Africa, waning fisheries have been linked to cascading socio-ecological deterioration on land (the results proving just strange enough for a National Geographic TV series). Peer into Cuba’s protein-poor markets and imagine Africa’s situation, flipped. Is the empty butcher shop in the article suggestive of creeping pressure on alternative protein sources? Surrounded by water, will Cubans increasingly turn to “from the left” fishing, unmanaged by Raul’s reach? It’s unclear how much non-commercial fishing contributes to Cuba’s total landings managed through its 15 fishing associations (the Smithsonian has published Cuba’s commercial catch data in English). Already the UN reports that 87.6 % of Cuba’s fisheries in at a critical stage, with a 95% decrease of the region’s iconic Nassau Grouper. While diving in Cuba’s Bay of Pigs, I saw few Nassau Grouper. I assume, from their catch, the men fishing from shore did too. They had speared a giant spotter eagle ray, something not uncommon for Mexicans but less traditional for Cubans. Not for sale, the ray was for la parilla – the grill. “There’s a lot of meat in the wings,” the eldest explained. This relative of the shark is protected in Florida; I watched it hacked in front of me feeling, surprisingly, little condemnation. My time in a discordant, enigmatic Cuba had fatigued the conservationist inside me. All morning I had watched the youngest of the men appear at 50-foot depths. Unlike me, he was unaided by dive gear, only a spear in hand. The spear’s velocity echoed underwater. Pheeeww. Thud! The fish impaled that day were small and infrequent. The giant ray was a lucky pull, pedaled home to backyard grills on bicycles. Revisiting the images I snapped that day, I believe one conveys the same Cuban story of food insecurity captured in this month’s National Geographic. In print, a 1950s Chevy roars past the echoing Havana butcher shop. In mine, a hand-rolled cigarette dangles against the turquoise seascape that provides a meal untethered by ration cards. By good fortune, I’ve been a recent explorer of Cuba’s coastline. Before visiting Cuba for research, I had romanticized about a people and an environment trapped in time. When traveling in Cuba, should you order lobster? Well, it depends. Whether in a coastal village or a colorful Castro-fied restaurant, I found plenty of seafood when traveling in Cuba. That’s easy for any tourist. The real challenge for me was matching my plate with my moral compass. Near the sleepy village of Playa Larga, there’s a government-run restaurant that targets tourists peering into one of Cuba’s blue holes. It peddles lobster almost as hard as Che Guevara t-shirts. The waiter really pushed the local surf-n-turf special on me: farm-raised alligator and lobster tail. My colleague and I were on research budgets; we reluctantly split it. We faked interest in a FIFA game, gobbled grub, and soaked in the lush, canopied setting between dives. We paid the check with raised eyebrows, realizing we had eaten for 1/4 the price elsewhere. About forty Canadians began bustling towards the shaded tables with a Cuban minder. These tourists were about to dine a stone’s throw from the turquoise sea, over looking an underwater cave, en route to visit the Caribbean’s largest wetland. They almost all ordered, you guessed it, the pricey lobster and alligator special. I couldn’t blame them; the food matched the ambiance. Isn’t this why they came to Cuba in the first place? This though crossed my mind: should the seafood-seeking tourist be celebrated? Under Raul’s new order of business tolerance, ordering seafood from a mom-and-pop shop could, in theory, funnel money more directly to fishermen. Think about it: for the first time in decades, Cuba’s mindful traveler can avoid the government middle-man and distribute tourism dollars to private, small business owners (who’s average monthly salary from the government would otherwise be about $20). The fishing docks of Playa Larga, a small coastal village sitting on Cuba's Bay of Pigs. Fancying ourselves mindful, my colleague and I mostly avoided the government-run tourist hubs, preferring to spending our CUCs (the Cuban currency for foreigners) at B&B-style casas particulares along the coast. That’s how we ended up in sleepy Playa Larga (see image above). Our entrepreneurial hosts served us lobster tail every night, if we wanted, for less than $4.00USD a meal. Surely, I thought, with over thirty pastel canoes tethered just yards from the B&B, the local fishers of Playa Larga must be benefitting from the up start of lobster-seeking B&Bs in town. Wasn’t my lobster-hungry, sustainably-traveling tummy contributing to the sleepy Playa Larga economy? Or, as this month’s article suggests, was my appetite stealing from Cuban’s plates? And, important for my environmental ethic, how does this all trickle back to help sustain the ocean? Once you consider the coagulating, percolating force of Cuba’s black market, tracing the web of sustainable tourism gets sticky. It turns out that the lobster I was eating at the B&B was purchased on the black market. Meaning: the fishery that got lobster on my non-government-controlled tourism plate operates completely under the radar, completely unmanaged. Which is the last thing Cuban lobsters need. The fishery collapsed in 1990, with the government since scrambling to improve management with scant resources. What my plate took from the ocean went un-accounted and, if anything, contributed to the fishery’s consistently declining landings since 1990. With all that in mind, should I order lobster the next time I’m in Cuba? Now — As a conservation-leaning biologist, I support Cuba’s efforts to rebuild its fisheries through monitoring, management, and fisherman compliance. As a conscious traveler, I support small business owners that boost local, suppressed economies. My experience in Cuba highlights the growing pains of a burgeoning business sector and antiquated fisheries policies. Then again, the growing pains of governance seems a common theme in this month’s NGM article — and most of the articles I’ve read about Cuba this year. At the moment, I see no clear answers for my moral compass. The next time I’m exploring Cuba’s coast, I’ll wait for the $30.00 lobster tail in the Havanna high-rise. Or, better, yet, I’ll just stick to the chicken. A multibeam echosounder image showing the undersea volcano called Havre Seamount, including a new cone that formed during the July 2012 eruption. Back in August, an enormous floating mass of pumice was spotted in the South Pacific Ocean off the coast of New Zealand. 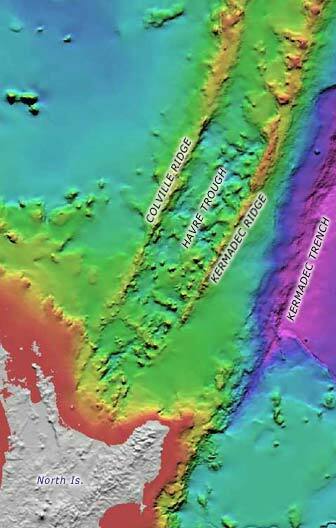 New evidence of changes on the seafloor confirms an erupting undersea volcano created the sprawling rock raft. New Zealand scientists aboard the research vessel Tangaroa recently mapped the underwater volcano, Havre Seamount, which erupted on July 19 and was thought to have sent pumice rocks floating over a stretch of ocean 8,500 square miles (22,000 square kilometers). Now, the scientists say they detected a new volcanic cone — a feature built during an eruption — at Havre Seamount, reaching within 3,600 feet (1,100 meters) of the surface. (Pumice forms when volcanic lava cools quickly. On Aug. 9, the HMNZS Canterbury ship observed the floating pumice "island" — measuring 300 miles (482 kilometers) in length and more than 30 miles (48 km) wide. The floating fluff apparently "lit up a brilliant white color" under a spotlight, "like the edge of an ice shelf," said Lieutenant Tim Oscar, a Royal Australian Navy officer, in a statement at the time. The researchers from New Zealand's National Institute of Water and Atmospheric Research (NIWA) aboard Tangaroa are currently on the last leg of their 23-day voyage to study the Kermadecs, a volcanic island arc north of New Zealand. Their findings, along with an analysis of satellite images, make a pretty sealed-tight case for the pumice culprit. They had previously mapped this undersea volcano in 2002 using a so-called multibeam echosounder, so they could compare those images with the recent ones taken this month. They found these new volcanic cones, or miniature versions of the larger volcano, one towering at 787 feet (240 meters), on the rim of the caldera, NIWA marine geologist Joshu Mountjoy told LiveScience. "The new map shows that the internal wall of the caldera now has up to 180 meters [590 feet] of lateral 'bulging' indicating the location of future eruption, or wall collapse," Mountjoy added. Their analysis also suggests two magma types were involved, an explosive type called rhyolite that shot pumice up to the ocean surface, and a less volatile one that settled out to build the new volcanic cones. "The rhyolite had high volatiles, much as a can of soda is full of carbon dioxide, so when it was shaken up and the pressure released on eruption (like opening the tab on the soda can) the magma came out violently and explosively, leading to ash and pumice that went from about a mile below sea level into the atmosphere," NIWA volcanologist Richard Wysoczanski wrote in an email to LiveScience. The geochemistry of fresh samples of pumice taken from around the Havre Volcano matched up with that of samples taken from the surface raft, Wysoczanski found. Here's how Wysoczanski thinks events leading to the vast raft went down: Sizeable earthquakes in the region on July 17 may have shaken up chambers of magma and caused movement of the basaltic magma well beneath the volcano. As it moved toward the surface, that magma would have intersected the rhyolitic, pumice-forming magma. "Contact between the two magmas would have triggered the eruption leading to an explosive ash and pumice eruption from the caldera floor as well as basaltic magmas being erupted on the caldera rim at the top of the volcano, forming the volcanic cones," Wysoczanski wrote. The Havre eruption tapered off by July 21, just days after it began, leaving behind the sprawling raft of pumice. Winds and currents have since spread the porous rocks into "a series of twisted filaments," according to the NASA statement. On Aug. 13, the pumice was spread over an area about 280 by 160 miles (450 by 258 kilometers). And currently, according to NIWA scientists, the pumice is still floating in thin filaments and it will likely take some time for the rocks to totally disperse. June 12, 2012 Southern Volusia / Northern Brevard County, FL. 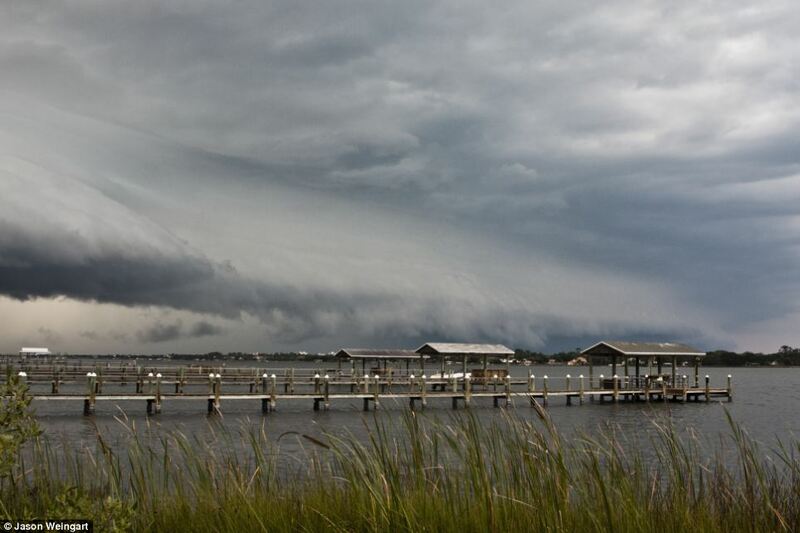 to produce a line of storms along the East Coast of Florida. 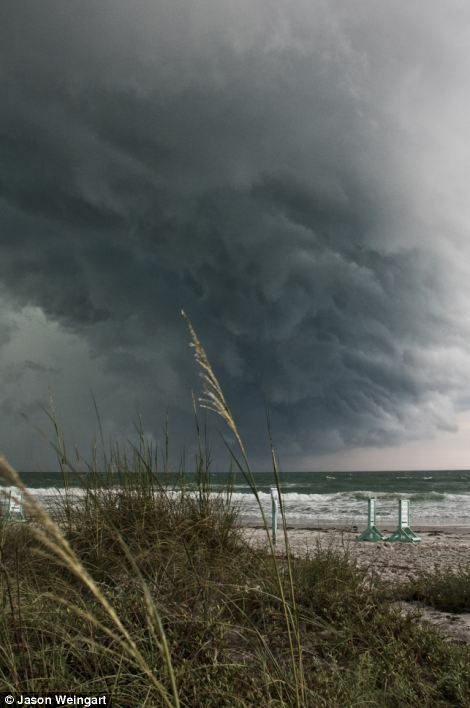 There may be trouble ahead - at least for the people living on Florida's Atlantic coast. 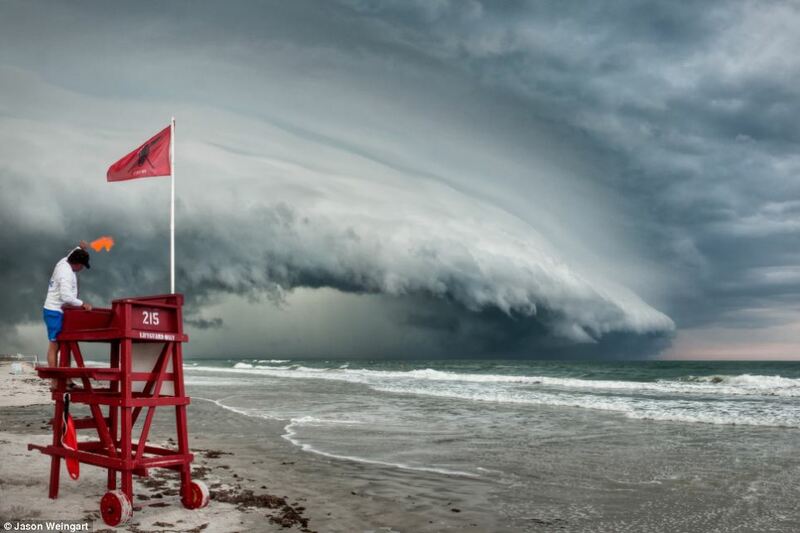 These stunning pictures were taken by award-winning photographer Jason Weingart at Ormond Beach and show a spectacular shelf cloud formation rolling in from the ocean. Shelf clouds are low, horizontal wedge-shaped arcus cloud, associated with a thunderstorm gust front or occasionally with a cold front. While they're are not dangerous, their threatening appearance certainly looks so. Moreover, they are a reliable indicator that a thunderstorm is nearby and could be arriving soon. Speaking about the picture, he said: 'I have shot many storms from the same spot this photo was taken, and I almost drove by to get a different vantage point, but something told me to just stop at my spot.